Dual Bay Hard Drive Docking Station with clone function USB 3.0 to SATA. This dual bay hard disk docking station can not only be used to secure your (old) files and data, but you can also clone your data super hard to another hard drive. Thanks to the double ports and a clone function, you can clone / duplicate your data in one operation. 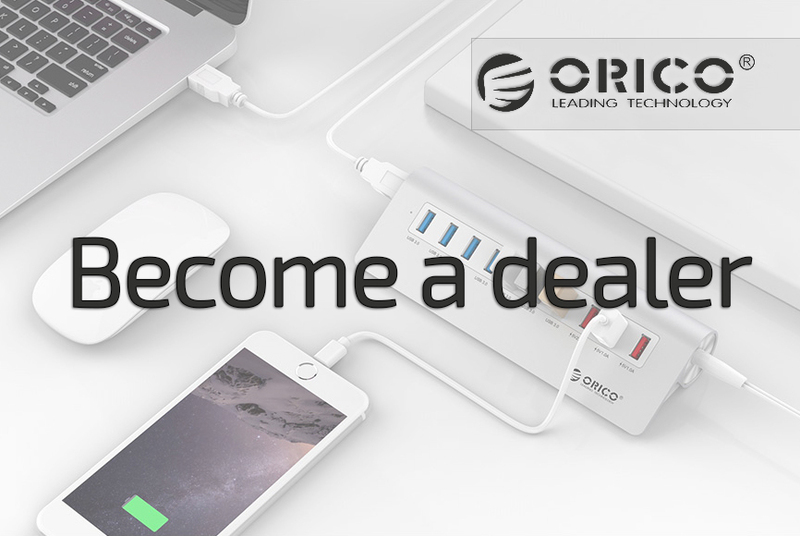 This dual bay hard drive docking station from Orico has two SATA inputs that you can use simultaneously which makes cloning and duplicating hard drives super simple. You place the hard disk to be cloned into one of the two SATA inputs and the dedicated hard disk in the other. 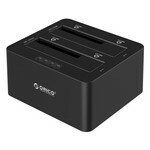 Of course this docking station can also be used for storing, deleting and updating data on your hard disks. No driver, software, technical knowledge and / or tools needed! Thanks to the user-friendly design, the docking station is ready for use within 10 seconds! 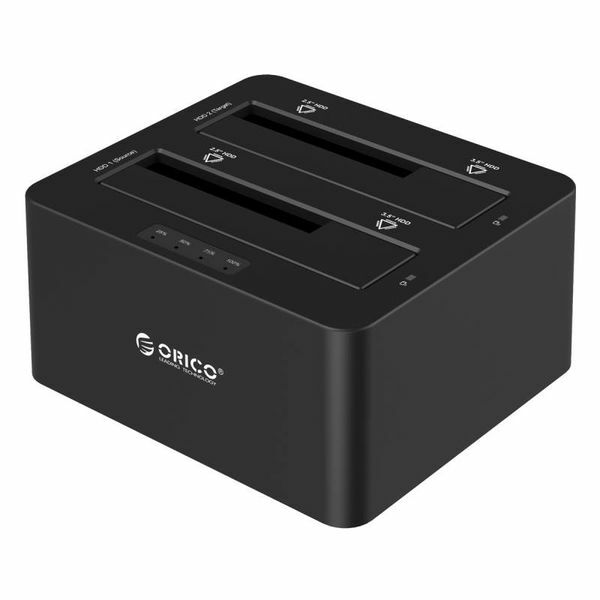 The Orico dual bay hard disk docking station can be disconnected while the computer is running. You can add or remove the docking station without having to shut down or restart the computer. 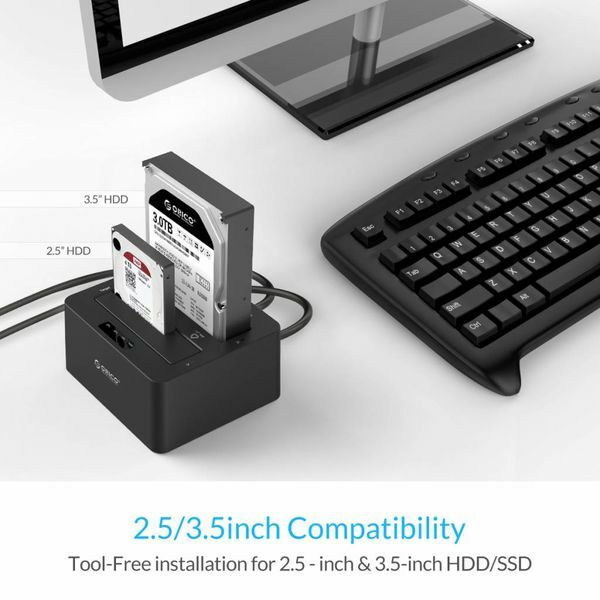 The dual bay docking station has two inputs that are suitable for 2.5 inch and 3.5 inch HDD / SSD hard disks up to 8TB capacity. 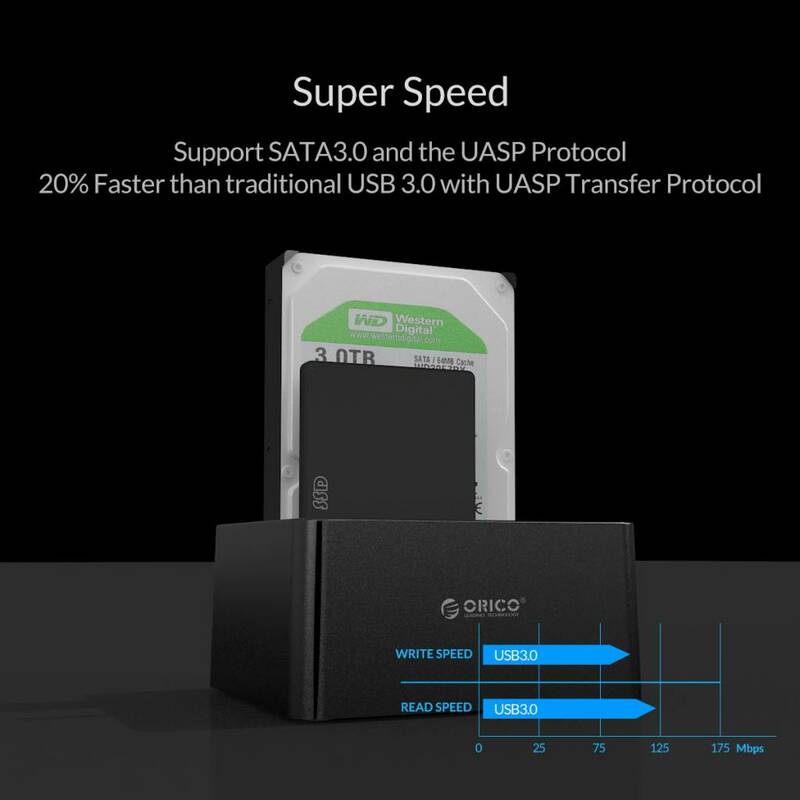 This gives you access to expansion possibilities up to 16 TB! 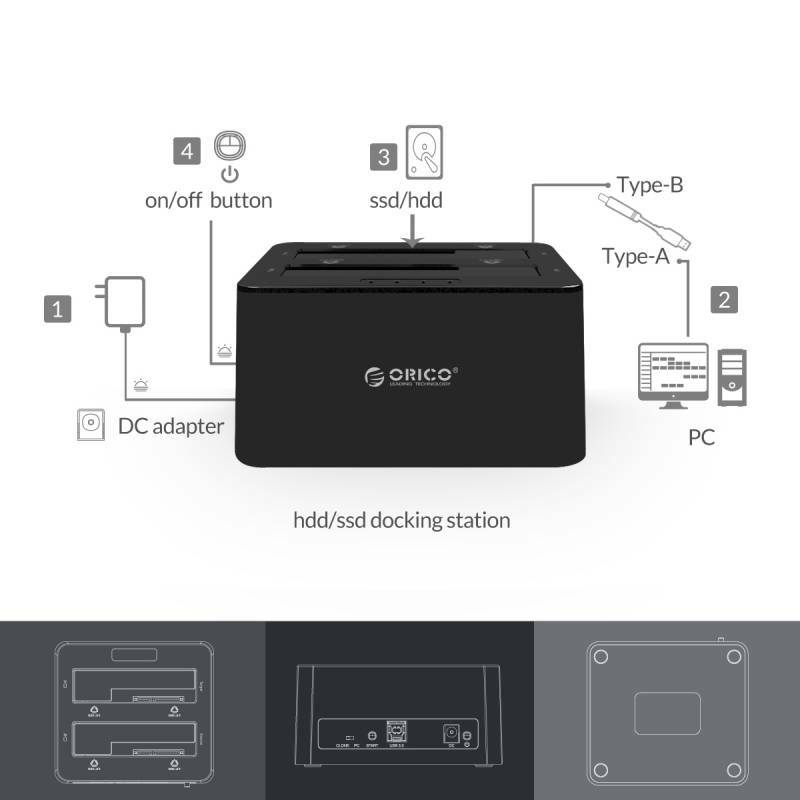 The dual bay docking station is compatible with SATA I, II and III and also with Solid State Drives (SSD). 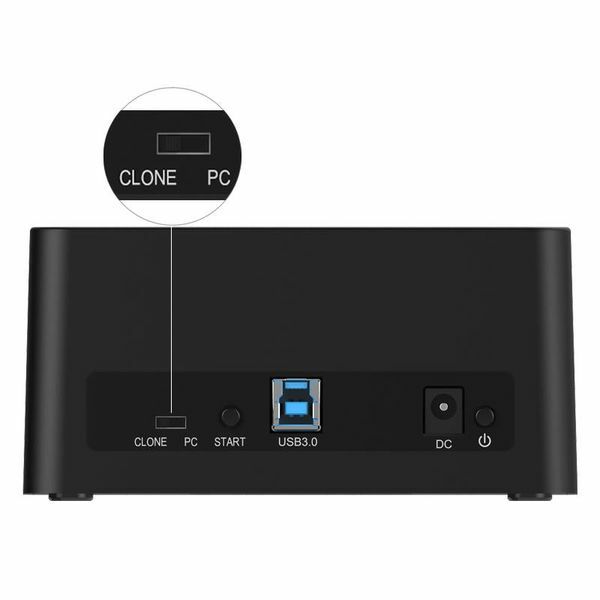 This dual bay docking station works with Windows 10/8/7 / Vista and XP and also with Mac OS 9.1 and higher, Linux and Unix. No driver is required for use. The dual bay docking station has a built-in SATA 3.0 controller, which not only ensures high speed up to 5 Gbps, but also supports the UASP protocol and reduces CPU usage. This way you experience maximum performance! 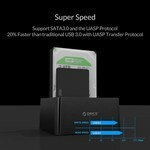 ✔ Suitable for 2.5 and 3.5 inch SATA hard drives (HDD) and SATA Solid State Drives (SSD). 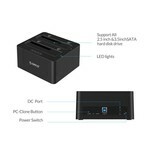 ✔ Including 3A power adapter for optimum power supply.